Diamond Harbour MP describes one of the accused as an ‘RSS man’. 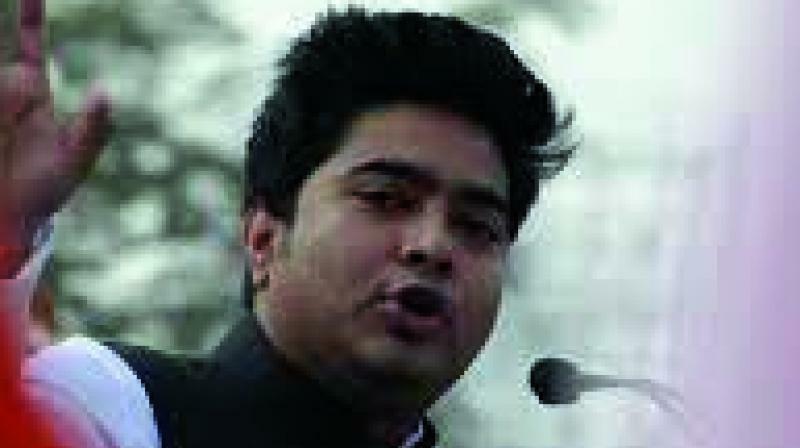 Kolkata: Chief minister Mamata Banerjee’s nephew Abhishek Banerjee has made it clear that BJP leader Mukul Roy would “not be spared” from facing arrest in the murder of Trinamul MLA of Krishnaganj Satyajit Biswas in Nadia. He even declared that he would “put him behind bars, dragging him by collar”. Rubbishing the BJP’s claim of faction feud in the Trinamul Congress that cost its MLA, the Diamond Harbour MP also described one of the accused, Abhijit Pundary, who is absconding now, as an “RSS man”. His assertions came a day after Mr Mukul Roy was booked along with three others by the police on murder charge in an FIR in the legislator’s killing at a Saraswati Puja inauguration on February 9 evening. Without taking Mr Roy’s name, he warned the BJP national executive committee member of allegedly being in the comfort zone despite his suspected role in chit fund scams. Mr Banerjee was speaking to the media after meeting Biswas’ family. Meanwhile, governor Keshari Nath Tripathi expressed “deep grief” over Biswas’ death. He conveyed his heartfelt condolences to the bereaved family, friends and thousands of people grieving, the Raj Bhavan stated.